View the Approved Recreation Guidelines Document. Recreation Guidelines were adopted by the Planning Board in 1992 to help determine whether recreational facilities provided for private residential developments are adequate, safe and efficient for suburban neighborhoods. Today, changing demographics in the County and concentration of development in urban centers point to the need for updated Recreation Guidelines that are responsive to these shifts and the County’s new Zoning Ordinance, enacted in October 2014. 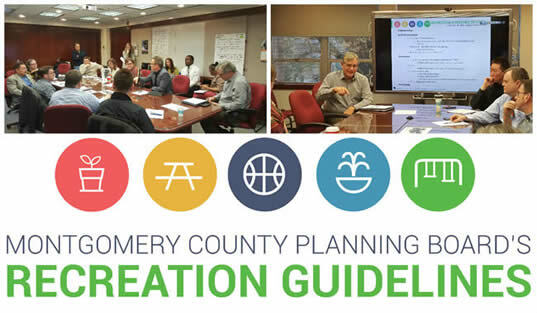 Planners are updating the Recreation Guidelines, studying new styles of recreation facilities for all types of neighborhoods and looking for effective recreation opportunities for all age groups, particularly for teenagers. The planning effort will examine the creation of effective regulations for urban recreation associated with private development in its attention to building form and open space. The new Guidelines point to a vision that promises to join new and existing facilities within a composite system that embraces both private and public realms and operates as a web-based interactive tool. View the Frequently Asked Questions (FAQs). Planning Staff will present the Annual Report on Use of the Recreation Guidelines to the Planning Board in Summer 2018. View the powerpoint presentation from Planning Board Session March 23, 2017. View the powerpoint presentation from the January 15 builders work session. View the powerpoint presentation from the December 9 work session.